Spend less time sitting in traffic and more time enjoying the ride during your Sturgis motorcycle rally vacation. An extra road will get rid of some of the congestion, which makes visiting more appealing! This road has been needed for years. As a 'tourist' I would love to have a better access road. Putting in the new byway will alleviate traffic through chocked roadways. As a visitor to the rally, I have seen the problems that exist and think it is an excellent idea to improve and put this road thru. The wait times going thru town are terrible and extremely hard on a Harley when the temps are high. I have been caught in the huge traffic jams. If the hospital is on one end of town and there's an accident or heart attack on the other it will be way better for the ambulance getting through with the new road. Yes! Sick of the overheating traffic jam. I'm from SD and have lived in Rapid for 10 years. Another road is LONG OVERDUE! The byway will allow us to visit the town and establishments and enjoy the time instead of getting frustrated and avoiding it. This road will make traveling in and out of the area much safer. What is Bikers’ Scenic Byway? 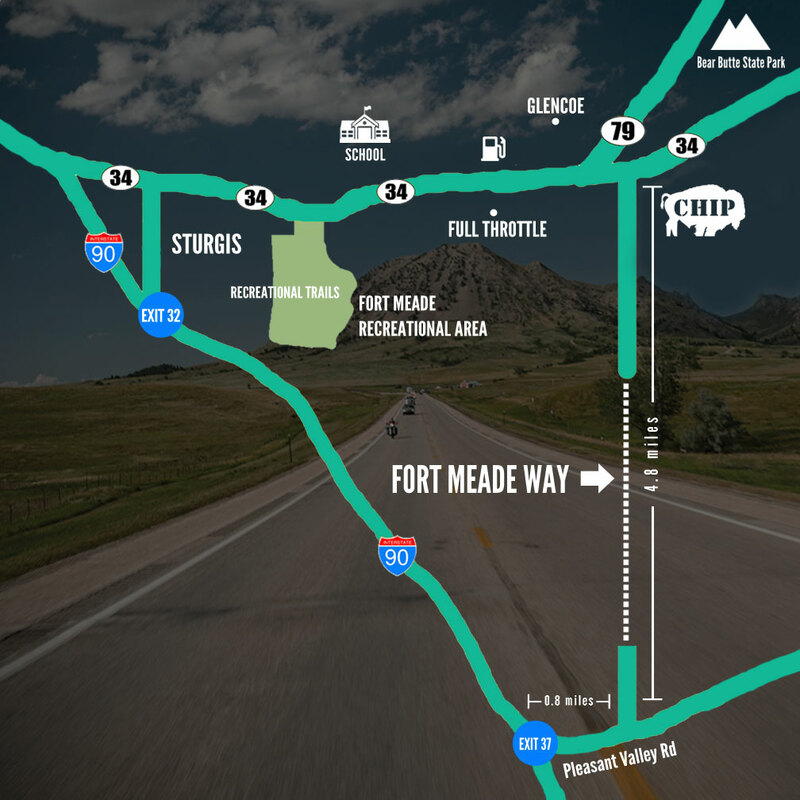 Bikers’ Scenic Byway, officially named Fort Meade Way, will be an alternate access route to the east side of Sturgis, SD for residents, businesses, tourists, Fort Meade Veterans Hospital employees and veterans, and Sturgis Brown High School employees and students. Right now Fort Meade Way terminates at two dead ends separated by approximately two miles of unimproved highway, which is what keeps folks from having a five or six-minute trip to I-90 from the east side of Sturgis. The road will connect Highways 34 and 79 to Interstate 90 at Exit 37. The Meade County Commission has accepted a bid for this road’s construction. It will be a wide and very scenic road. Who will benefit from Bikers’ Scenic Byway? When will the road be completed? It’s estimated to be ready for travel by the end of July 2016. Will the completed road be named Fort Meade Way on both ends? Yes. Both ends of the road are currently named Fort Meade Way. The road will be 66 feet wide (including the right of way) at first. However, the easement is 100 feet, which could allow Fort Meade Way to later become a paved road. What type of surface will the road have? We were told the road will be gravel treated with magnesium chloride (mag water). The road’s magnesium chloride chemical treatment will make its surface harder and more compact than untreated gravel. By binding road particles together, this compound will keep dust down, reduce erosion and help prevent the surface from becoming uneven or developing potholes. The easement is 100 feet wide so that eventually the road could become three-lanes of pavement. How much will the road cost? The winning bid came in at $1.28 million, which is less than half the cost of the $2.6 million estimated for the project. Why would taxpayers’ dollars be used to pay for this road? Local taxpayers have requested the completion of the section line for over 30 years. Those who will use the road pay taxes, and the businesses of the employees who will use the road likely pay a large percentage of them. Will building the road increase taxes or take away from school funding? No. Taxes will not increase due to this road. No school funding sources will be used to build the road. The stunning stretch of road will follow this fence line and offer alluring views of forests and prairie. A view of Bear Butte is seen from the scenic route. A monument marks the spot of Custer’s camp along the route.